You will need Bear with a Blankie: Of towelling effect D.K. yarn: 20g in Lemon (MS), and 5g in White; of standard D.K. yarn: 5g in Pale Pink and oddments in Dark Pink and Coffee. Bunny with a Dummy: Of towelling effect D.K. yarn: 20g in Lilac (MS), and 5g in White; of standard D.K. yarn: 5g in Mint Green and an oddment in Coffee. Kitten with a Mitten: Of towelling effect D.K. yarn: 20g in Pink (MS), and 5g in White; of standard D.K. yarn: 5g in Pale Blue and an oddment in Coffee. 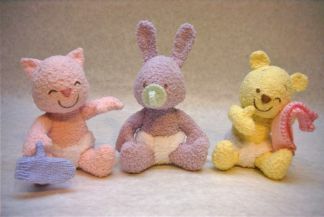 For each toy you will also need: Pair of 3mm (U.K. no.11) knitting needles; 20g of washable toy stuffing; long tweezers.